PC graphics got an overhaul with the new DirectX 11 API being released by Microsoft, along with its brand new Windows 7 operating system. A new generation of DirectX usually brings two things: 1st: GPUs with new features that piggy-back onto the new DirectX version's launch, and 2nd: GPUs that are significantly faster, while holding onto essentially the same market price-points. DirectX 11 is no exception. This time, AMD got to do the honors with its Radeon HD 5000 series GPUs, which has already become a generation of GPUs targeting nearly all price-points. NVIDIA, on the other hand invested time in developing a GPU in a way that has always worked for them: to make a powerful high-end monolithic GPU which dominates the upper quadrant, and then release derivatives based on it a little later. NVIDIA admitted to several developmental delays, due to 'unforeseen obstacles' for its GPU. 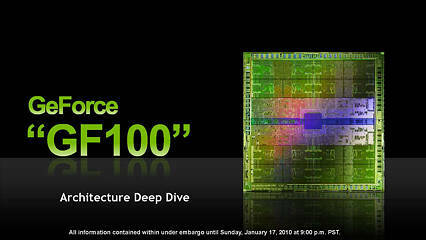 NVIDIA's new architecture codenamed "Fermi" was unveiled as early as on October 1st, 2009. Back then the move served as a market strategy more than anything, in the wake of AMD's launch of its DirectX 11 compliant Radeon HD 5800 series consumer graphics cards. It did however disclose a lot about the architecture NVIDIA was using, purely from the perspective of GPU computing, not touching anything on the subject of consumer graphics, DirectX 11 compliance, with game performance projections being a far cry. On hindsight, starting Fermi's press exposure from GPU computing was a wise move. It allowed NVIDIA to maintain ambiguity over the actual product's performance (in games, and in the market), while letting it talk about new technologies and features which would then allow the press to draw its inference from the press meet, and possibly chalk out its expectations from the consumer part. It is that consumer part (implementation of the Fermi architecture in a consumer-grade GPU), which has taken shape deep within NVIDIA's caverns today, that the company is willing to share a lot more with the press about the architecture from a 'consumer graphics' standpoint, which also opens up some direct performance projections from the company. The new GPU is internally called "GF100" or "GeForce Fermi 100", we will put it under the looking glass, thanks to a recent NVIDIA presentation at CES.